Scottish drummer Caroline Scott has become prevalent on the London jazz scene in recent years. She has played and recorded in a wide range of musical environments, from theatre shows and jazz big bands, to playing on BBC's Strictly Come Dancing. Caroline has worked with leading conductors such as Marin Alsop (a protégé of Leonard Bernstein), playing at London's Royal Festival Hall in March and April 2018. Caroline has also lived in Boston where she played regularly with jazz bands and orchestras at Harvard, Berklee College of Music, New England Conservatory and MIT, as well as gigging on the local jazz circuit. She plays drums with piano trio Cygnus Flare (who won the 2017 Yamaha Soho Jazz Sessions competition, played at Ronnie Scott’s and Pizza Express Soho jazz clubs and toured in Armenia), Tomorrow's Warriors, the MO Jazz Orchestra, the Swinging Magpies, and plays timpani in various orchestras including the Amati Orchestra and BBC Elstree Concert Band. She did a Masters in jazz drums at Trinity Laban as a fully funded Archers and Trinity College London scholar. Caroline is a Roland UK and Protection Racket artist. 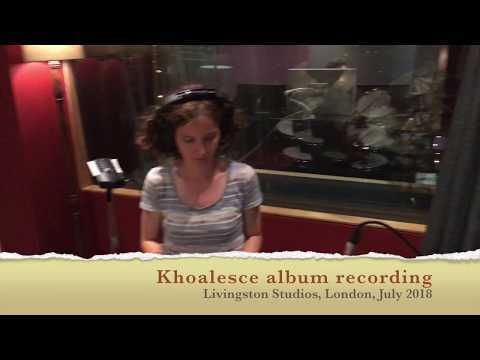 The Khoalesce project was started by Caroline in 2017 to bring together jazz musicians in London to develop and perform original compositions.